IcelandAir just announced the addition of three-times weekly in-season non-stop flights from Kansas City to Reykjavik, and from there you can connect to several primary and secondary cities in Europe. We have flown this route twice in recent years out of Minneapolis, and since I had already written up some tips for friends in the past, I thought I would share them here. This itinerary addition brings some great vacation possibilities for my Kansas City and Iowa friends, whether you are going on to Europe or just wanting to see Iceland at a reasonable cost. Almost every flight from the U.S. to northern Europe passes near Iceland, if you understand the geography of Great Circle routes, and this routing breaks up that long overnight flight about two-thirds of the way through. You typically get into Keflavik airport, about a 45-minute bus ride outside of the capital Reykjavik, very early in the morning (and six hours earlier in Kansas City “body time”). The airport is quite small and your flight onward to London, Stockholm, or some other destination city will only be a few gates away, leaving a couple of hours later. But the real benefit to this routing is that IcelandAir allows you to break up the flight in either direction at no additional fee. You can then spend a day or two touring this amazing country before either going on to Europe, or stop on the way back to the U. S.
Note that you have to book IcelandAir directly through their site. Fortunately, they have a “fare calendar” that lets you pick your travel days to get the best price, as they vary widely. It remains to be seen whether the limited schedule out of Kansas City will have the cheap European fare options that are often available leaving out of Minneapolis, but right now they are showing some July round-trip fares to Reykjavik for only $364. They also have an an easy-to-book “open jaw” system, for arriving into one European city and departing from another, which we have used both times. If you do decide to make this diversion, you should plan on at least two nights, as about all you will be able to do the first day is wander around Reykjavik in a sleep-deprived daze. Two different operators provide efficient bus service from the airport to the capital timed to arriving flights, and you can either book in advance or at the airport. The view out of the bus window on this ride often looks like the surface of the moon, but other parts of Iceland are much more scenic. Both services will drop you off at your hotel, where you can store your bags even if you can’t get into your room. At our last hotel, the centrally-located Hotel Leifur Eiriksson, the clerk invited us to eat the complimentary breakfast, which was still being served, a very nice gesture. 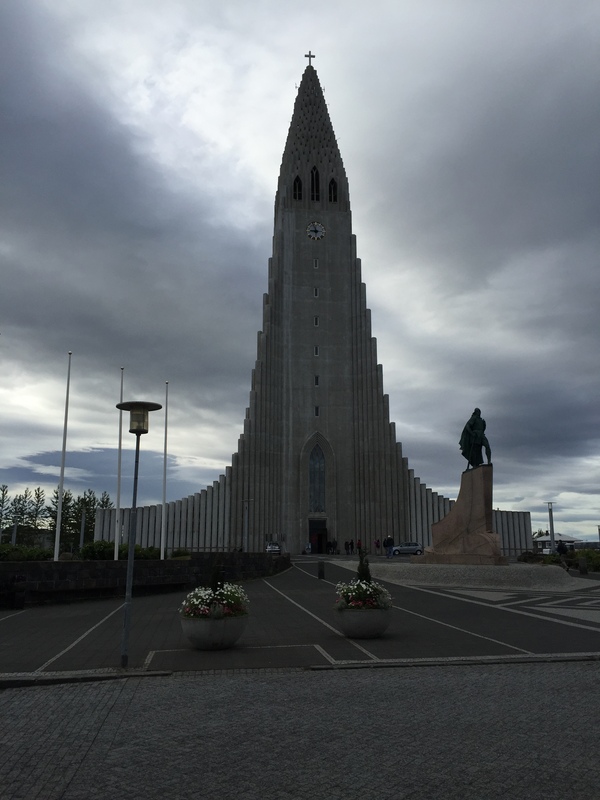 Most of what you will want to see in Reykjavik is in the very walkable “Centrum,” although the Hotel Leifur Eiriksson is up a long incline near the highest point in the city, and right across the street from the tallest building in Iceland, the national church Hallgrimskirkja. An elevator ride up the tall steeple is a great way to get your bearings of the city. This hotel is older, although impeccably clean. On our prior visit we stayed at the budget-priced Hotel Cabin, which is bit too far of a walk from the Centrum for comfort, about a mile away. This hotel is also well-kept, but the rooms are literally the size of cruise ship cabins, thus the name, I suppose. A word about prices. They are high, at about the Norway level, although they have come down a bit from the crazy heights of just before the 2008 economic crash, which hit Iceland especially hard. Fortunately, some of the best food is “street eats,” with hot dogs oddly being a specialty here. One stand, Baejarins Beztu Pylsur, is the most recommended, however we never seemed to be near this one around mealtimes. Our most memorable meal was at a very reasonably-priced and casual seafood restaurant tucked away down near the dock area. At Sægreifinn (Seabaron) on Tryggvagata (“gata” means “street” in the Nordic languages) you select from a variety of kabab skewers of fish pieces, along with a selection of fish soups and seafood bisques. They will grill your selection and serve it to you on long communal tables. My selection of Arctic char was superb. There is very little “Old World Europe” to see in Reykjavik, as it was a tiny fishing village up until World War II. 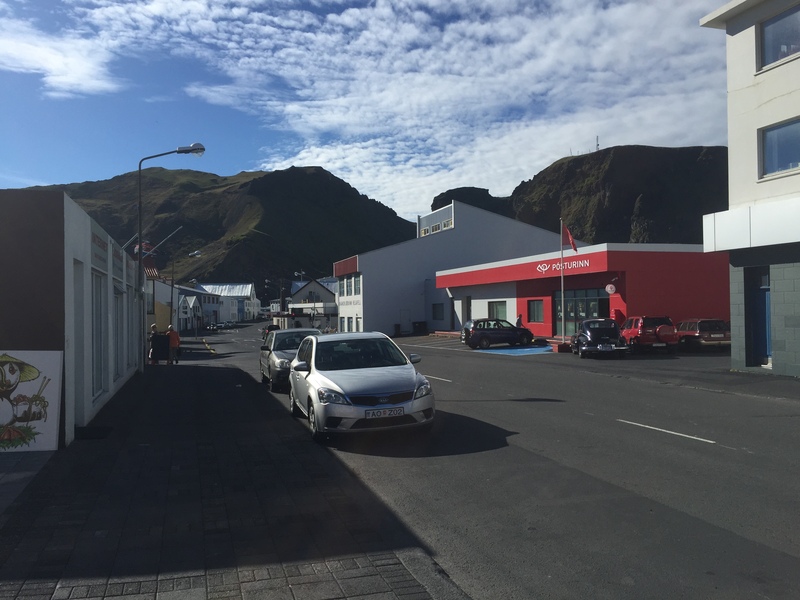 But the Centrum has a pleasant pedestrian-only shopping street, Laugavegur, and the entire city is very clean and safe. The National Museum of Iceland (free) is one of the best we have found in Europe in terms of chronological layout, language accessibility and items of interest. The Radhus (city hall) is located next to a lovely pond, and it is a major gathering spot. The Settlement Exhibition, located under a hotel on Tungata, is small, but you can see a fascinating archaeological dig of the oldest Reykjavik settlement found right there, dating to the 9th century. Reserve at least one day for a bus trip, offered by both of the same operators who do the airport transportation. A bus will pick you up at your hotel and drop you there at the end of the day, although you may be directed to change to a different, larger bus at a central collection point. 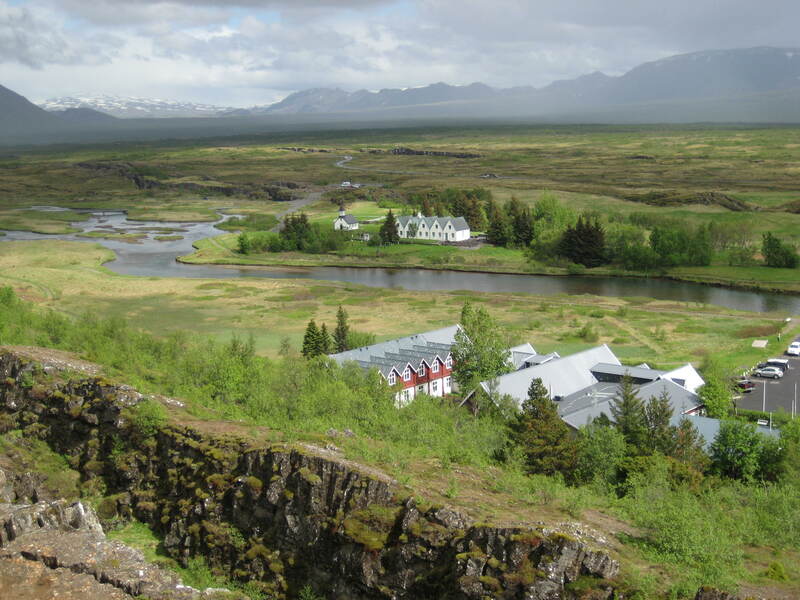 The most popular all-day itinerary is the “Golden Circle Tour,” which will hit three highlights: Thingvellir (Þingvellir with the Icelandic “thorn” character), is the place where the first Viking parliament gathered in A.D. 930. It is located on the “gap in the Earth” where the tectonic plates are spreading at just under one inch per year, and you can see the split stretch for miles. This fault is the primary cause of the volcanic activity, and numerous geysers and hot springs on the island. The nearby main Geysir area contains several impressive geysers, and is where the very word came from. 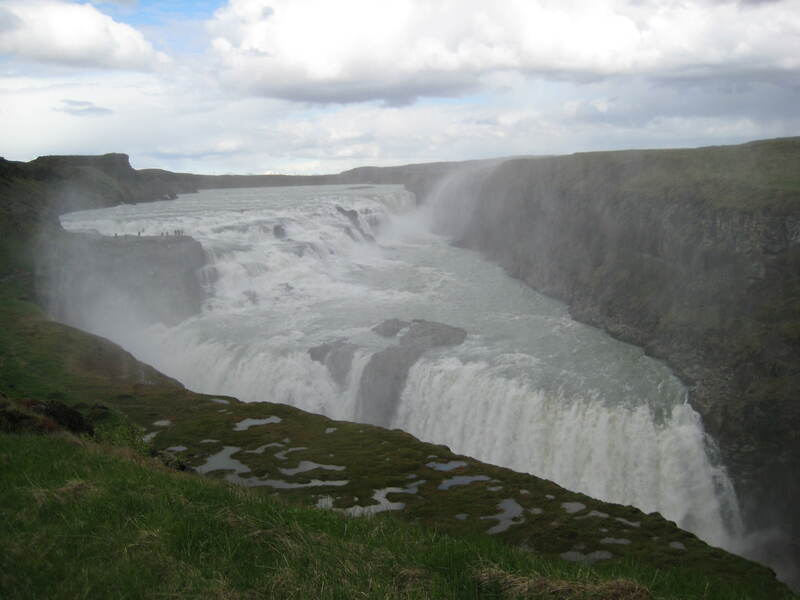 Finally, Gullfoss is an impressive waterfall that seems to disappear into the Earth, although it is really dropping into a very tight canyon. And you will still get back in Reykjavik in time to enjoy a very long summer evening. Our second bus trip was a much longer and tiring day, but well worth it. You get a very early start to catch a bus for the southern coast, about two hours away from Reykjavik, where you catch a ferry for the short trip to the Westman Islands, or Vestmannaeyjar. Here you will take a small bird-watching boat tour around the main island, and then a bus tour around the island, with a stop for lunch at a local restaurant. These islands were almost wiped out by a volcanic eruption in 1973, and you will visit a museum built right at the edge of the “tuff,” the cooled lava rock ejected from the volcano. The museum includes a half-buried house. Other tours possible possible out of Reykjavik include the famous heated Blue Lagoon and hiking trips to glacier country. By the way, be dressed for cool, wet weather, even well into July. Iceland is clearly a different world, and it is now accessible from Kansas City for under $400. Pass this blog along and start planning your summer! There are currently about 100 Icelandic krónur to the dollar, making for an easy conversion. ATMs are widely available and credit/debit cards are widely accepted. English is spoken everywhere. Hotel Leifur Eiriksson is showing about $320 per night in July for a double room. Hotel Cabin is showing about $237. Prices are going up in Reykjavik. Book early. The primary bus operators are Reykjavik Excursions and Gray Line. The Golden Circle Tour will run about $100 per person, less for kids, and last about eight hours.